Two of my friends wouldn’t stop praising the Veil Mineral Primer by Hourglass and how amazing it is. So, once I was done with my old primer, I made sure to rush down to Sephora and grab myself a bottle of this seemingly amazing primer. After first use, I was already impressed and probably will never change to another one. Love how the texture is silky smooth, lightweight and sits on my skin well, even after I’ve put my foundation on. It helps with keeping my makeup intact all day and controls the shine on my face (especially t-zone area). Highly recommended to combination/oily skin. The price for Hourglass Veil Mineral Primer is definitely on the steep end (RM259), but it’s really worth every cent considering how long the bottle will last. Remember, a little goes a long way. Product is available in Sephora. I wouldn’t call myself a makeup guru – I tend to keep my daily makeup routine as simple as possible. Using multiple makeup brushes was too much of a hassle for me, but I didn’t want to apply product using my bare hands either. So, using sponges was an obvious solution. Everyone’s heard of the Beauty Blender, but after reading a number of reviews, a second name kept appearing again and again. Enter the Real Techniques Miracle Complexion Sponge. Many called the Real Techniques sponge a great dupe for the Beauty Blender, with some saying it was even better! I had to try it for myself. And it sells at a fraction of the price of a Beauty Blender. The Real Techniques Miracle Complexion Sponge can be purchased online. Its thick but non-sticky consistency. A little goes a long way with this tube! The product holds its own. I don’t have to reapply very often, even after I’ve eaten! The scent is glorious, I chose the black tea & raspberry. As I learn more about the importance of protecting our skin from sun damage, I find myself investing in more products with SPF. The lip skin is so delicate that we should not forget to protect it as well. It’s not white! Its gel-like form is completely clear, making it suitable for EVERY SINGLE SKIN TONE out there. This alone is already why Glossier is winning. It absorbs extremely quick, which is a convenient factor for those looking to apply makeup right after. It’s not greasy at all but if you have oily skin, I suggest patting some powder on after. Perhaps the Wowder? The packaging is light and super cute! Its got all the good stuff like aloe leaf extracts, Vitamin E, Vitamin P and brocolli to keep your skin protected from pollution and free radicals. It’s a little pricey thanks to the ridiculous exchange rates at the moment but it’s really worth your hard-earned money. Especially if taking care of your skin is priority. 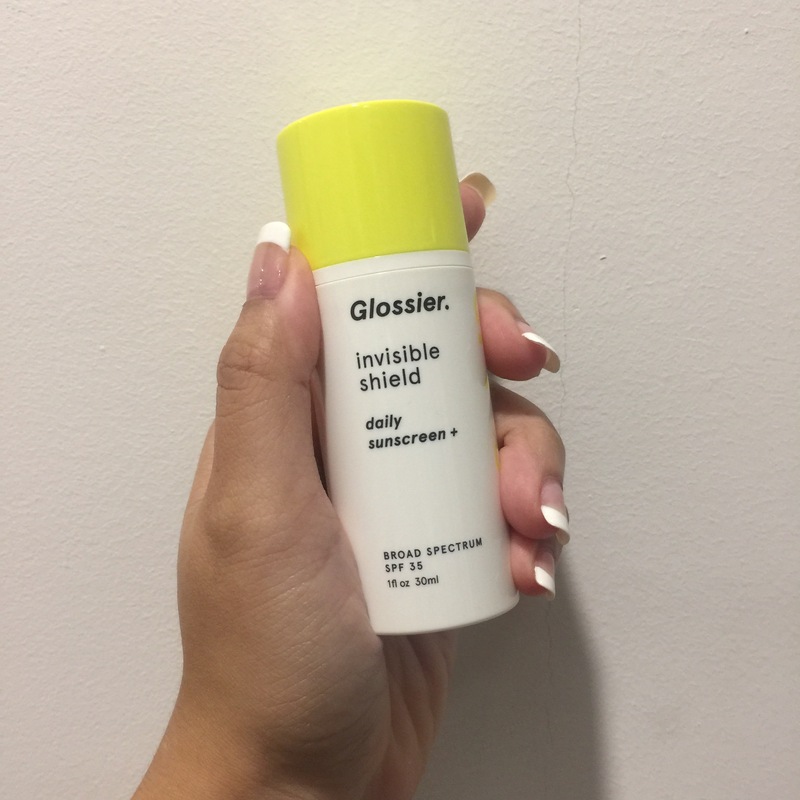 Cop your Glossier Invisible Shield Daily Sunscreen+ on Glossier’s website. I Stopped Using Dating Apps For A Year. This Is What I Learned.